It’s fitting that the final stop along the Middletown Heritage Trail is the General Mansfield House. 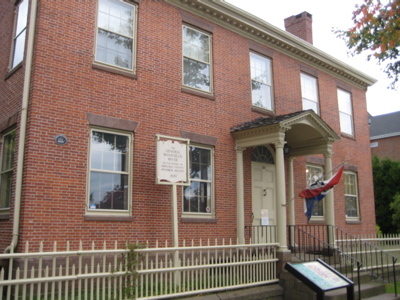 That’s because as an outstanding example of the federal style, General Mansfield House has served since 1959 as the Middlesex County Historical Society’s headquarters and museum space. At the museum at General Mansfield House, visitors can explore the community’s past through major exhibits, which showcase artifacts from the Historical Society’s permanent collection. Recent exhibits have examined Middletown’s 19th century women’s clothing, varied immigrant groups; the rise and fall of manufacturing in Middlesex County; and death and dying from colonial times to the present. A permanent exhibit, Hard Tack, Salt Pork & Faith, movingly explores local soldiers’ experiences in the Civil War through photographs, military gear, diaries and letters home. One of the few residential structures still standing on Middletown’s Main Street , General Mansfield House was built about 1810 for Samuel Mather, a local merchant. The house was later occupied by his daughter Louisa and her husband, General Joseph King Fenno Mansfield, a Civil War hero who died at the battle of Antietam in 1862. In due course, the house passed into the hands of Mansfield’s youngest daughter Katherine, who lived in the house until her death in 1918. In the late 1950s, General Mansfield House was slated for demolition to make room for a new parking lot. By acting quickly, the Middlesex County Historical Society was able to purchase it from Mansfield’s descendants, thus saving the house for everyone in the community to enjoy. For some reason there is also a display here about baseball. Baseball flourished in America after the Civil War. 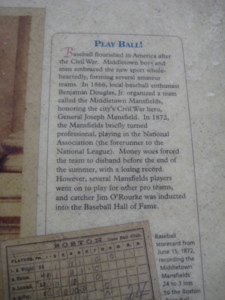 In 1866, local baseball enthusiast Benjamin Douglas, Jr. organized a team called the Middletown Mansfields, honoring the city’s Civil War hero, General Joseph Mansfield. In 1872, the Mansfield’s briefly turned professional, playing in the National Association (the forerunner to the National League). They disbanded towards the end of their first season, citing financial woes.